To hear Barack Obama and Eric Holder tell it law enforcement in the United States is overrun with white-sheet-wearing, dyed-in-the-wool racist, sexist, and homophobic cops bent on violating the Constitutional rights of every person of color they encounter. They present the false image of racist cops who go out on ‘search and destroy’ missions, regularly looking for minorities to abuse and discriminate against. The president and his attorney general imply that policing in America in this day and age consists of nothing more than officers picking on poor, unfortunate, and innocent black people who are minding their own business, just so a community can keep the city coffers full. Perhaps it’s time to take a look at exactly what those racist cops are doing out there on America’s streets to generate so much animus. And why policing in America has come under so much fire from the Obama Administration and others who base their findings on a relatively small, yet well publicized number of incidents involving the police and minorities across this land. Take Ferguson for instance. Two police officers out of a police force of fifty-two sworn officers recently resigned for making and sharing obviously racist comments in a departmental e-mail which was discovered during the Department of Justice’s investigation into the Ferguson Police Department, following the ‘fully justified’ shooting of Michael Brown by Ferguson Police Officer Darren Wilson. Two officers out of fifty-two doesn’t seem at all to me to be representative of a police department overrun by raving racist lunatics. And the instance described in the DoJ report certainly doesn’t provide evidence of unfair and racist enforcement of the law on the part of the two officers involved. The fact that a larger percentage of minorities were issued traffic citations or arrested than their percentage of the population might have something to do with the fact that this particular area of North St. Louis County has a much larger percentage of blacks residing in or passing through than other areas. In fact, due to the high crime rate it’s a part of St. Louis County that many people of all races just simply avoid. There are also some smaller municipalities and unincorporated areas within the vicinity of Ferguson that have a far higher percentage of blacks residing in them than does Ferguson. It’s certainly reasonable to believe that those individuals might also pass through Ferguson on one of the major thoroughfares that transit the community. The residents of north St. Louis City, a predominantly black and high crime area which is a short distance from Ferguson also needs to be taken into consideration, as those individuals would also necessarily transit Ferguson on a fairly regular basis. But the “facts” released by the DoJ alone do not indicate that racism is running rampant on the Ferguson Police Department. Contrary to what Eric Holder and Barack Obama would want one to believe. Have there been an inordinate number of complaints against the police force by individuals who claimed racism ? Is it the fault of the police department that blacks who have met the qualifications and requirements have not applied for jobs as police officers in Ferguson ? If a wealthier community in another part of St. Louis County is also concerned about the ‘diversity’ of their own police force and they can pay higher salaries to recruit officers away, is that also the fault of the Ferguson Police Department ? Or is it just simple economics, and no indication of racism on the part of Ferguson officials ? Certainly there are individuals of all ethnicities who are indeed racists. One could make the case that Al Sharpton and Louis Farrakhan exhibit overt racism against white people on a fairly regular basis. And in fact wasn’t it also racism committed against Officer Darren Wilson by those black “witnesses” who fabricated the “hands up don’t shoot” lie that changed his life forever, and caused the rioting in Ferguson ? While incidents of racism do in fact occur and are committed by people of ALL races, institutional racism has long been a thing of the past. Were it not, would we ever have elected the first black president ? When residents of a community complain about crime, including nuisance offenses that affect the quality of life in a neighborhood, police departments respond with aggressive policing. It’s not “profiling” when blacks are targeted and the community is predominantly black, and the vast majority of crimes being committed against that community are being committed by black offenders. It’s just good police work. Aggressive policing results in citations, summons, and arrests, which is not at all indicative of some out of control racist police officers, but is reflective of the police department’s efforts to maintain some control over the streets and address the problems which good, decent citizens are asking the police for help in dealing with. While outside agitators like the New Black Panther Party helped wreak havoc in Ferguson, others who didn’t give a damn about Michael Brown were there simply to take advantage of an opportunity to loot area businesses. 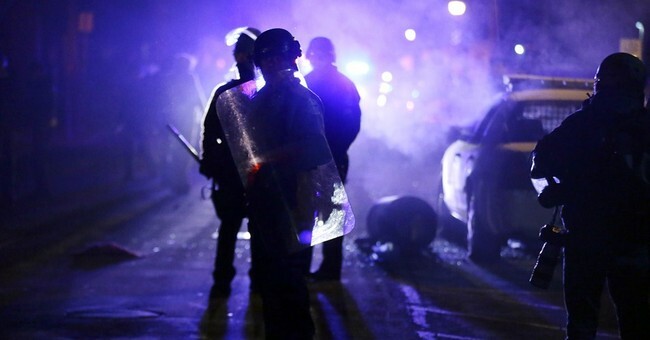 Many critics in the media decry the “militaristic tactics” used by the police during the rioting. But to do so without any real understanding of what was actually occurring on the streets of Ferguson during those times is unfair. Police officers were being shot at repeatedly by snipers. They had rocks, bricks and Molotov Cocktails thrown at them. They were faced with an extremely aggressive crowd which was being choreographed by radical Black Panthers and other anarchists from out of town, who were there for the express purpose of creating a riot and to kill a police officer. And then possibly provoke an even stronger police response in order to hopefully spread their civil unrest across the area, and even across the country. Police officers have rights too ! They have the right to go home to their loved ones unharmed at the end of their shift. They have the right to expect people to obey the laws that the police are entrusted to enforce. They have the right to be treated with respect and dignity. Sitting in the comfort of a television studio a thousand miles away, talking heads on Fox News, CNN and all the other networks decried the police response to the rioting. And other news outlets even convicted Officer Darren Wilson long before the investigation had been completed. I wonder if those talking heads would feel the same way if one of their loved ones was a police officer placed in Darren Wilson’s difficult situation, or served their community as an officer standing the line against complete anarchy on the streets of America. Maybe the next time police officers are called upon to try to quell an out of control situation which places innocent people’s lives at risk, those who have the benefit of time and reflection to second-guess the police will perhaps take a deep breath and think about the reality of the situation before they criticize the police for doing what’s necessary to protect and serve. And just maybe once the Obama Administration is gone this ‘War on Police’ engineered by Barack Obama, Eric Holder, and the Democrat Party will end. And then real progress can be made to undo the damage that has been done over the last six years to race relations here in America.